Managing your Axels can be very intensive. For example, you should regularly update your Axel thin clients. This can be in the form of a firmware upgrade or a new configuration. 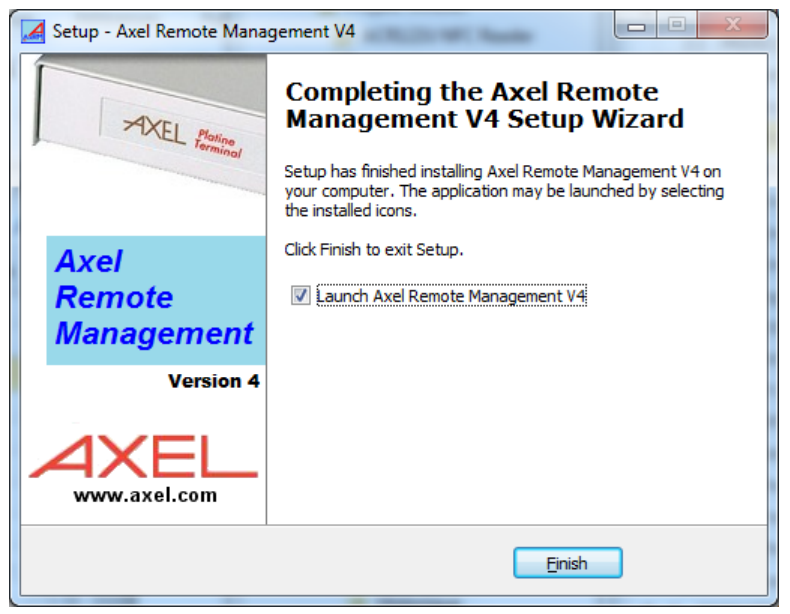 To simplify management, Axel has introduced a new tool namely the Axel Remote Management (AxRM v4). 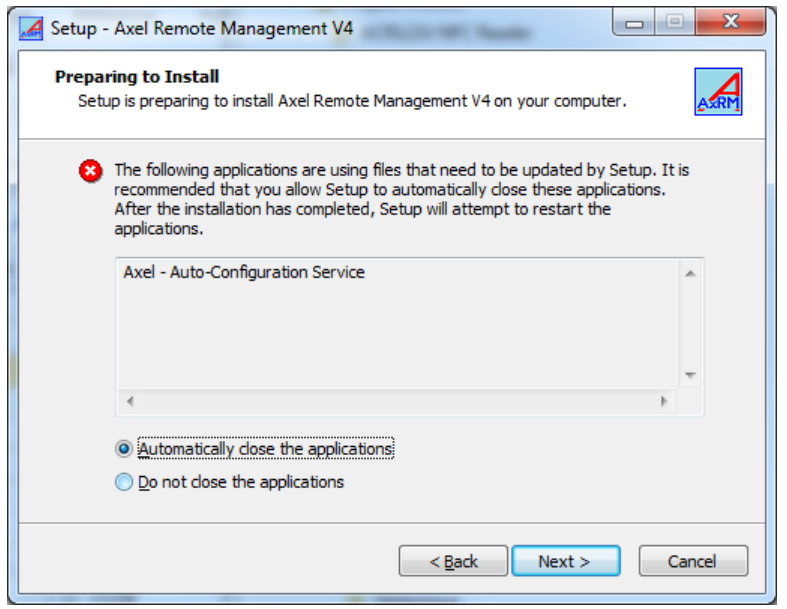 In this blog we explain how you can update several Axels at the same time with the help of this tool. Before you can use the management tool, you first have to download the software and install it on a dedicated PC with Windows or Linux. In this blog we explain only the Windows installation. 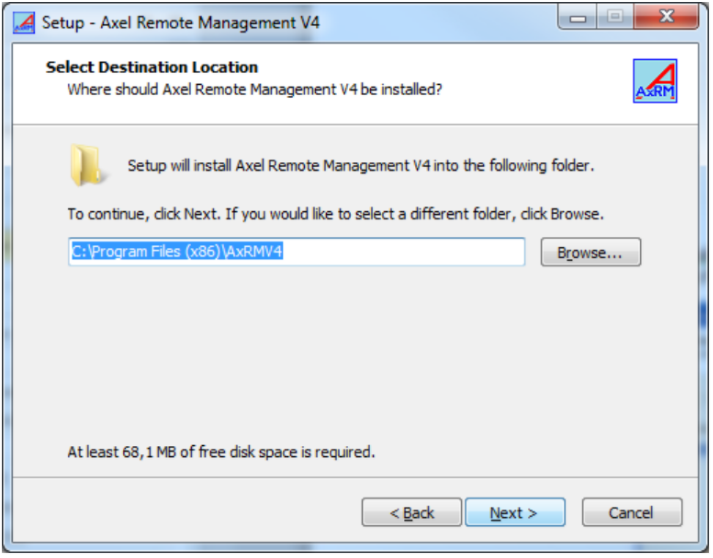 You can download the AxRM v4 management tool from the Axel download page. The link can be found here. Pay attention! For Windows, both 32-bit and 64-bit software are available. Download the software that applies to you. After downloading the installation process can begin. To start the installation double click on the exe file and follow the instructions. 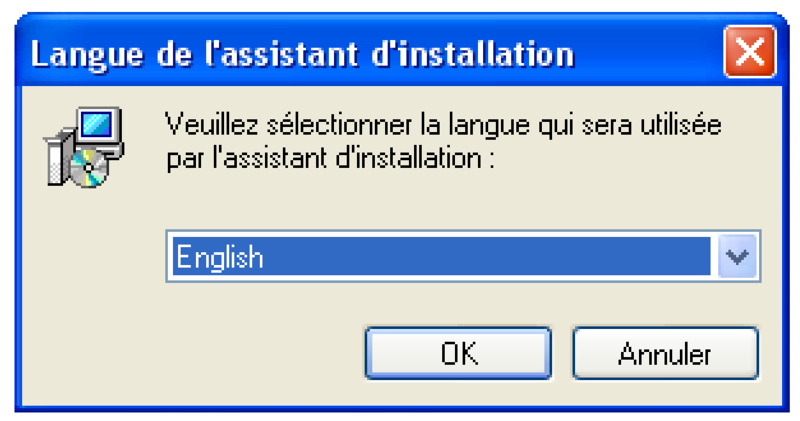 Note: for Windows 7 and later, follow the installation as administrator. The first screen is the language setting. Select your language here and click OK.
You can specify a different location for the file to install. Click on browse and select your desired location. In the next screen you will have the possibility to whether do or don’t choose a desktop icon. Click Next after making your selection. A short summary now appears. If this information is correct, click on Install. 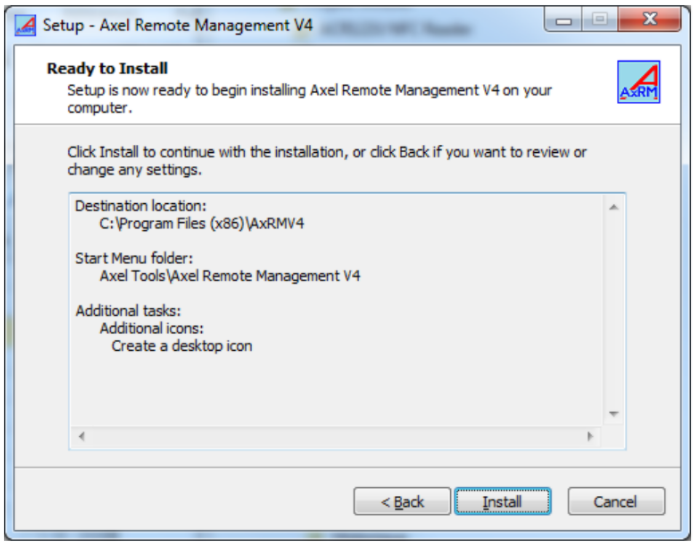 Is AxRM Remote Management currently running a previous installation of AxRM you can get the following message. Select Automatically close the applications. The older version of AxRM is now being removed and replaced for the new version. The next screen confirms that the AxRM Auto-Configuration service has stopped. Click OK to continue. The installation is complete. We can now start using the program. Now that the software has been installed successfully, we can start preparing for the update. You have successfully installed the Axel remote tool. The program can now be used by opening it. If you are using the program for the first time, please enter the language and IP address of your host. Then click Next. You can change this information at a later time if necessary. 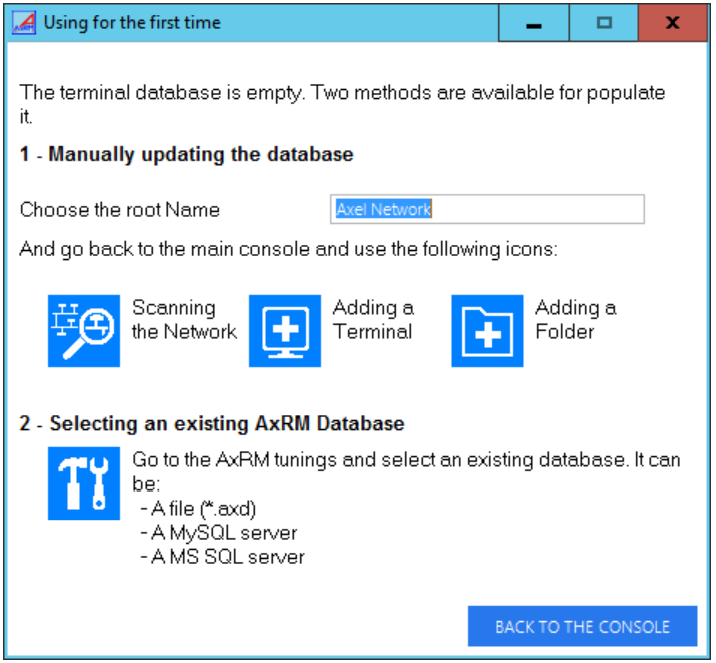 AxRM keeps a database of all your Axel thin clients. If the program is used for the first time, the database is empty. You will then see the following screen Using for the first time. Two options follow, option 1 is manual updating of the database and option 2 is loading the existing database. Choose which one applies to you. When this is successful you will see all your Axels in the main console. 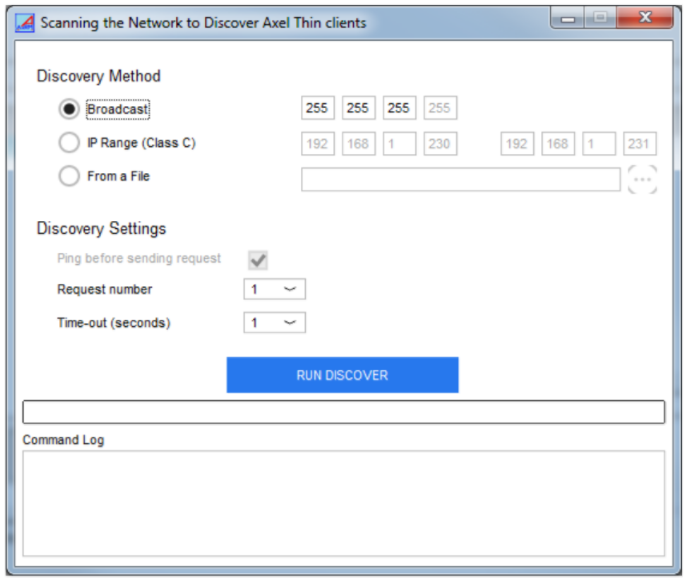 To get your Axel thin clients easily and quickly in your database, we recommend you to choose the Scanning the Network option. Click back to the console. Select broadcast and enter your IP number and click on Run Discover. It is also possible to use the default settings as you see on the screen. An SNMP is now sent to each terminal. A list with your Axels is compiled and displayed. If you are using the software for the first time, you will see an absent status in the status of all thin clients. Select the thin clients you want to include in your database. Click Update the Database. Please note, restrictions may occur in your LAN. As a result, it may be that not all Axels are displayed. This is often caused by your router configuration. 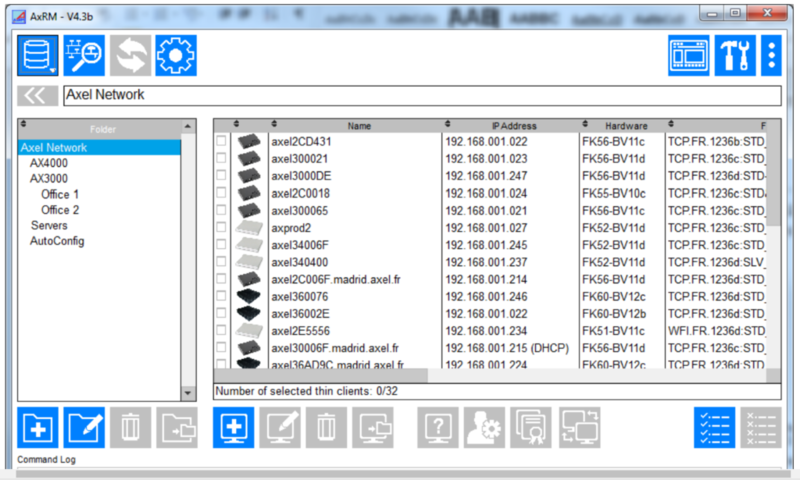 You will see the selected Axels appear in the main console after updating the database. From this console you can update the Axel thin clients remotely. When all Axel thin clients are loaded into the program, you are ready to update your Axel thin clients. Click on the corresponding Axels in the main console that you want to update. Then click -right mouse button- and choose remote administration. Click on send firmware. When all this has gone well, the following screen appears. Click on […] and browse to the new firmware for your Axel. This is the firmware that you downloaded from the Axel website. Select the firmware and click on open. Now click on Run Command. Your Axel is now being update. Your Axel wil restart 2 times. The update has succeeded successfully. 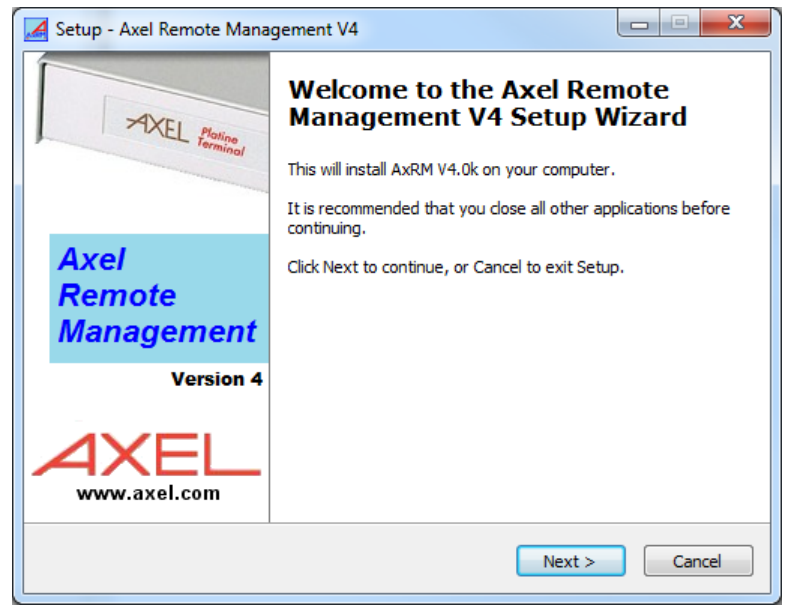 Manual updating of your Axel software, as described in this document, is one of the possibilities of Axel’s management tool. What you can do even more with this program is for example auto-configuration. With auto-configuration you can automatically provide all your Axels with the right configuration, regardless of the type. You create a config file for every Axel. 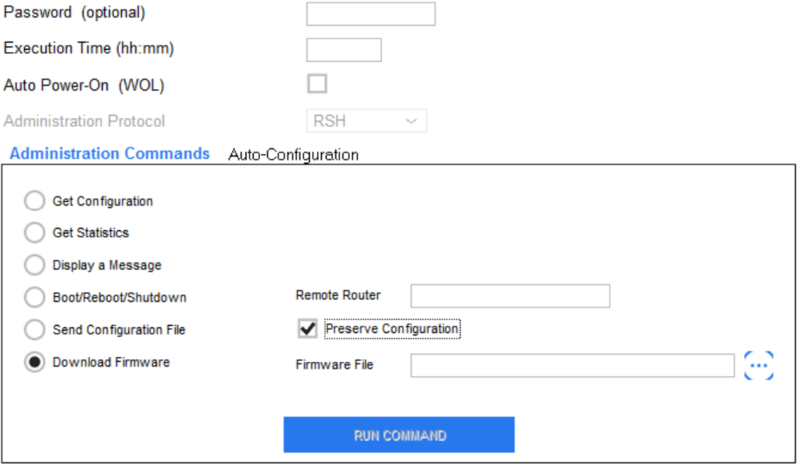 When this type of device is detected on the network, the specific config is taken over. Automatic updating is also one of the possibilities. 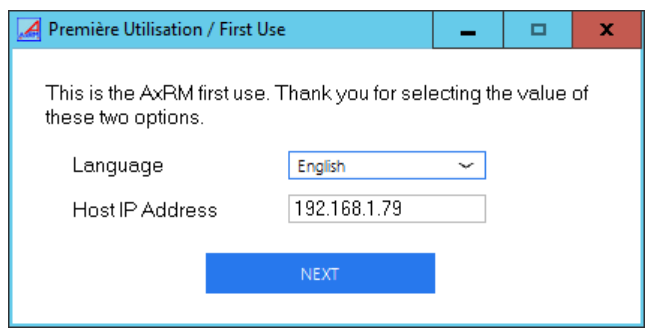 Would you like to know more about how you can use these functions within AxRM? Please contact us. Questions or need any help? Do you have any questions after reading this manual? Or are you unable to update your Axel thin clients? Our Axel specialists are ready to support you. Call us directly on telephone number +31 (0)88 – 751 02 02 or fill in the contact form.